Hutschenreuther Figurines for sale affordable pricing ! 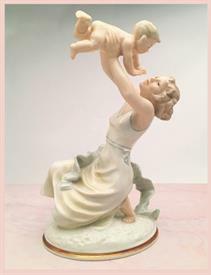 ,'Mother's Darling' Limited Edition Porcelain Sculpture Designed By K. Tutter Ca 1940S. Hand Painted & Initialed By Artist. 11" Tall.